Two books extrapolate business insights and lessons from the world of rock 'n' roll. As much as I am obsessed with biz books, I often find business wisdom in tomes that seem to have nothing to do with commerce. A few years ago, for example, I reviewed a book about the underground culture of pick-up artists, since many of their principles and practices were applicable to sales, marketing, promotion — even human resources. I once read a biography of Neil Young strictly for pleasure and realized that it, too, was a biz book, with lessons on branding, product development, marketing, logistics and more. Plus, he owned Lionel Trains at the time. I switched gears and reviewed the biography from a business perspective and got a lot of great feedback. The review was picked up by newspapers all over the country; even in Australia, much to my surprise and delight. Here are two recent books from people who learned valuable business lessons from their rock 'n' roll experiences. Jam! How to Run Your Business Like a Rock Star. Jeff Carlisi, Dan Lipson, Jay Busbee. Jossey-Bass. 254 pages. Jeff Carlisi was a guitarist and songwriter in the Jacksonville-based band .38 Special. I'd worked with him a few times and was always impressed with his positive, professional demeanor. It should have been no surprise, then, to read this upbeat book that uses his career trajectory as the basis for some very smart and practical business and personal guidance. Carlisi, now a principal in a corporate consultancy specializing in team building, is joined here by his partner, Dan Lipson, and professional writer Jay Busbee. The trio tells the story of how the band got started and developed, up until he left in 1997. Carlisi's carefully selected anecdotes emphasize hard work, collaboration, tenacity and other vital attributes. While there are few, if any, surprises herein, his breezy and entertaining text presents a solid primer for success in most any profession or endeavor. I'm sending a copy, in fact, to an itinerant musician I know who might benefit from learning these fundamentals. 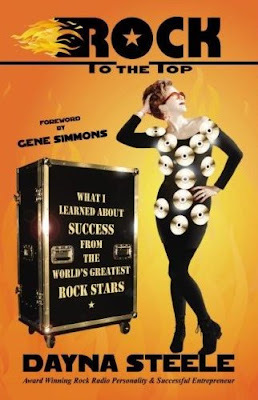 Rock to the Top: What I Learned About Success From the World's Greatest Rock Stars. Dayna Steele. Brown Books. 135 pages. Steele was a rock jock and radio station music director in Houston and her book is a bit more nuts and bolts that Carlisi's. She also utilizes an impressive résumé in an entertaining and instructive way, but her unique perspective -- from both the talent and the business end -- offers a view from each side of the stage. The glitz and glamour of the music business during the latter part of the last century belied much its hard economic realities. Nowadays, it's far from uncommon to encounter entertainers who are more involved in their business than in their art. Steele's observations from the back and front of the stage are witty, incisive and applicable to a variety of situations. True tales of encounters with Michael Jackson, Sammy Hagar, David Crosby and others add flavor and atmospherics but the real value of this book is Steele's levelheaded and intelligent insights and extrapolations. Gene Simmons, relentless marketer and TV personality, contributes the book's foreword and he was either paid a fortune to do so or recognizes and respects the author's expertise. My money is on the latter. Cool blog - and post - which I just now discovered. Yes, there is much to learn about business, and especially business TEAMS from rock & roll bands, at least the great ones.